A snowstorm hit Seattle over MLK, Jr. weekend that resulted in our campus closing from Tuesday night through the rest of the week. Snowstorms in the city are rare and can shut down the entire public transportation system. 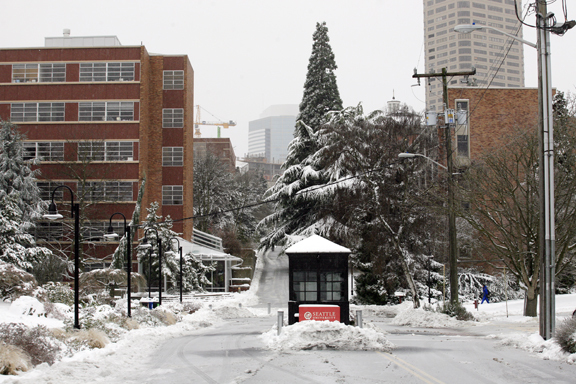 At Seattle University, our inclement weather communications plan includes protocol for posting updates on our website, general phone line, local news websites, campus-wide email blasts and social media. During the week of “Snowmageddon,” as we dubbed it in our office, our social media outlets turned out to be a vital source of information sharing. 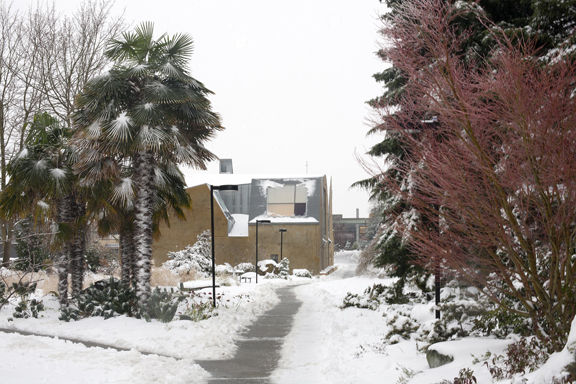 Seattle University campus during the January snowstorm. Image by Chris Joseph Taylor. Each day of the snowstorm, as other universities announced closures and cancellations, people flocked to our Twitter and Facebook channels seeking information. Facebook and Twitter are easy and fast to update and allow for rapid exchange of information. It’s easier to update Facebook several times with small updates and news than it is your website. News outlets, hungry for content, scan social media for images and videos, which can lead to greater exposure for the university. This can be a great opportunity to get your campus in the local media. Social media gives a platform for opinions, which can be helpful in determining the mood in the community and future planning. It’s a lot of work for your social media manager and communications team. During Snowmageddon, Seattle University was closed from Tuesday night through Friday but many of our team members worked 12-hour days, staying up late waiting for updates and decisions and then rising before six a.m. to share information and answer questions. Social media gives a platform for opinions. Above, this was listed as a pro— but it can also be a con. Those opinions are often negative, and users are easily frustrated when information is not shared quickly enough or decisions are not to their liking. Comments can stack up fast, so Facebook, in particular, requires constant moderation. As much as you might want to delete a negative comment, you can’t as this could lead to increased backlash. Should your university find itself in a “snowy” situation this school year, don’t hesitate to make Facebook and Twitter your go-to places for news and updates. Of course, you’ll want to cover all your bases regarding your website, phone line, etc., but more audiences are turning to social media for current information and also to compare you to your neighboring schools. If you don’t have a social media manager, identify someone on your communications team who can take the reins of moderating your university’s social media accounts. This person should be comfortable handling a variety of comments—positive and negative. Give this person a lot of caffeine and pats on the back as he or she won’t be sleeping much for a few days! Maintain good communication between your social media manager and the person who makes decisions about closures and cancellations. The social media person is going to be on the front lines answering questions and fielding criticism, so he or she needs to be well-informed and up to date. Have some official language drafted that’s approved by your school’s decision makers that the social media person can share on Facebook and Twitter. Be sure to think ahead and have language prepped for multiple situations. Be prepared to supply the local media with images and video of your students enjoying the snowy weather. With a little organization, you can maximize a rare opportunity to capture a different aspect of campus life and share it with the world! The Seattle University campus under a blanket of snow. Image by Chris Joseph Taylor.